Sabayon, the Gentle Gentoo: Gentoo, formerly known as Enoch Linux is one of the pioneers among the Linux distributions. It is well-known and loved for its speed (the Gentoo species is the fastest swimming penguin), and hated for its unfriendliness with Linux newbies. Thus, many flavors of Gentoo have been created including this highly capable one named Sabayon. Sabayon is made in Italy and created by Fabio Erculiani. He named it after an Italian dessert called Zabaione. The reason behind this tasty name is yet unclear but Linux users’ appetite for Sabayon can’t be denied as it is currently ranked number 5 on Distrowatch.com. Sabayon’s main aim is to transform a computer into a powerful Gentoo Linux system in less than 5 minutes. 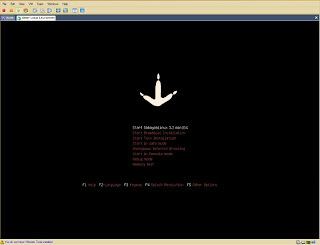 The link to the download site for Sabayon Linux is here. There are variety of installers to chose from which includes the DVD and Mini Edition supporting processors with 32 and 64 bit architectures. However, I would recommend the DVD for beginners for a reason that I will disclose later on. 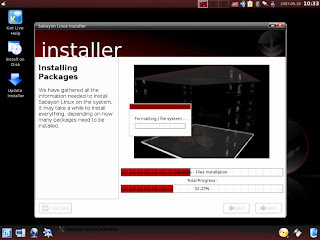 Anyway, the installation on my VMware System using the Mini live CD was completed in about 15 minutes with a unique feature that will let you update the installer before you start. Thanks to Anaconda, only few easy steps were necessary for the installation. It would have been a different story if it was done in an old Gentoo way. After the installation, it rebooted smoothly with all virtual hardwares detected. The audio, floppy, cdrom, ethernet, and usb controllers are working well. Sabayon is short of being artistic in this edition. Most themes and wallpapers included are part of KDE by default. They could have added a few extras. Though I like the default Sabayon theme, I'm not that much of a KDE fan. The only good part is that it comes with Beryl which can be easily enabled. So if you have a capable video card, then you are just a few clicks away to eye-candy insanity. Now here's the sad part for the newbies; The mini edition doesn't come with adequate software applications installed off-the-shelf. There's no Gimp, AbiWord and OpenOffice, just to name a few. Even though you can use a graphical portage package manager with a funny name called Kuroo to add or maintain software in Sabayon, it is not as easy as you think compared with say Ubuntu, PCLinuxOS, or OpenSuse's package management systems. That is why I'm recommending the Live DVD installer for beginners because it is pre-installed with plenty of useful applications to choose from for free, of course. Gentoo is considered one of the most stable if not the most stable distro ever. I was not surprised that Sabayon Linux inherited its quality. Though I have not tried Sabayon long enough, I can already say that it can be reliable for a long period of time based on the initial tests I made which includes running several applications simultaneously and probing its hardware support. In addition, I was also very amazed with its speed. It is very fast indeed, with a start-up loading time faster than any other distro I've seen so far. Sabayon is certainly not for everyone. But because of its quality, versatility and many advanced features, it is undeniably worth a try. I would recommend Sabayon to Novice users and to those who are bored with their Ubuntu or PCLinuxOS distro. But for experts or advanced users, you may also utilize Sabayon as a Linux web server. To those who are just migrating from Windows to Linux , in short extreme newbies, don't ever think of touching it. Sabayon may sound sweet, but when tasted it could lead to a bitter experience. Excellent review. Sabayon and all other Gentoo flavors are indeed too hot to handle especially to the inexperienced users. I had previously been running Sabayon for about the last 6 weeks. There is a lot to love about this distro, and much to hate for the inexperienced user. The Distro once installed is a Linux Gamer's Dream come true. I think that is where it really shines. Where it falls short is in the updating department. Most of the users I've encounted recommend you wait for the next DVD release, and update your system that way. There is a world update tutorial on their wiki, but it did not work for me, and left my system with hundreds of broken packages. I'm not saying that will be everyone's experience, but it was mine. Luckily I'm experience enough with Gentoo, to work through fixing it, but for a newbie, it would be a complete nightmare. I will be keeping a watch on this distro however, because I think they've got tremendous potential, and if they keep going in the direction they are headed, they'll be a distro to be reckoned with, maybe within a year. I tried Sabayon way back when it was called RR4. Sabayon is light years ahead of where it was just a couple of years ago. I agree with you Whitt. Sabayon took it to the next level with this version. In order to become even more popular, they must strive to improve their software management. But I know that they are on the right track so I'll be keeping my eye on Sabayon also. A killer review. Linux needs a kind of exciting article like this one. Thank you. I haven't tried Sabayon yet, but I am planning on doing so in the near future. As to what Whit said about broken packages, I was wondering if he tried using rev-rebuild after updating? I know on Gentoo it tells you to run this after updating some packages to make sure all links are working. Yes I did try rev-rebuild, and it scrolled through a few hundred packages, and although I can't remember the error message at the moment, I know that it ended in error. I think the discouraging thing, is when users tell you to wait for the next dvd release and use that method to upgrade. My experience may be different from other users, however. I still think this distro shows a lot of promise. The 3 times i tried to update everything all i got left was a hosed system after 2-3 days of compiling, reading stuff, trying various fixes, finally running the last etc-update, hoping it would be ok, only to see the system was broken at the next reboot. I heard the latest release is better in that regard but haven't had the time to try it once again. I've tried Sabayon once; it's a cool distro, although it comes with KDE. The speed is one of it's stronger points, but emerge is slow as hell. You are building from source...emerge will always be slower than using .deb or rpm's. I've ran sabayon for a while now, I get more oooh's and aahhh's from it more than any other distro. Great review. I'm surprised about emerge. Never tried gentoo, but I always thought that was its big claim to fame. Or is Sabayon's version just not as good as gentoo's? I know it compiles everything from source. I was talking about the slow update speed of the repositories. It takes too long to update the list of software from the repos. please keep the useless rhetoric out of your reviews. Gentoo is hardly the "fastest" linux (one of the top I'm sure, but that crown belongs to others), and most certainly will not match the stability of a slackware or debian etch. Great review of a great distribution! Sabayon really is a linux gamers dream, and I have found that using fluxbox with KDE installed behind it gives me my perfect desktop! However, I think it is fair to say that the updating of this distribution is pretty poor and to say that most users recommend simply waiting for the next release to update something is a bit shocking! You are doing the linux community a service with a review like this, its about time someone wrote something interesting! Since Sabayon don't separate different arches for different machines, it was just too slow. 3.4F was compile under i586, not i686. That makes it runs as slow as turtle. In other side, Sabayon is a good boot CD for install Gentoo with an internet connection. I have trouble to drive my new Intel 4965agn wireless card under Gentoo Live[CD|DVD] 2007.0. At last, I use Sabayon LiveDVD to install it successfully. It also support ext4, that's good. I am trying it right now. Good distro, not great for newbies (which I am but am willing to trudge through what's necessary and learn). As for updating via the next DVD remember this. It might seem like an extreme comment but in the last year they released 6 stable releases (not including mini or business/professional editions or counting 32 and 64 as different). If they keep up that pace it means that every 3 months at most you should have a new distro (and to be fair there's no real need to update every single month. I have been using linux on and off for over 10 years. The last 6 months I cracked it with windows and started to look again at linux as my main system. I tried suse 10.3 which was pretty good but caused me quite a few problems, so I ditched it and went to pclinuxos. This is a great distro for newbies and gives a familier windowz feel, but no good for me as I had problems logging out then trying to log back in with another account and only a reboot would fix anything. 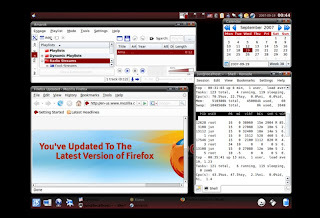 I also had to re install every month as I couldnt log on at all even root.I took a look at Sabayon due to th art angle it has and so far I am quite impressed although the package system can be improved upon, now add a package manager like pclinux or suse and I belive that sabayon is a work beater. I am also really impress with the virtual box finding all my hardware and a smooth installation of windows along with cd support and sound as well as usb. now if only i could find a really decent account program for my buiness that also handles gst windowz would be a gonna. I've changed from windows to sabayon 3.4. It was the first linux that reconized every piece of hardware. With a lot of searching i can now manage my own linux pc! thei updatingm however, im much more difficult than gentoo, because the number of packages that is installed ih much higher.. Gentoo, you only install taht you use, butsabayon not. gentoo users said that sabayob uses binaries in the live cd,bu it is no so tru. all emerge packages is compiled.. Sabayon is a Gentoo, not Gentoo like!, but it is difficult to use! resuming, it is not for newbies,but is a great distro! I reccomend to Sabayon users, do not run emerge --sync,or emerge world, or you my obtain many broken, blocked or masked packages. Emerge only that you use! even emerging open office, destroyed libraries! But, if you enjoy gentoos, sabayon is the best!!! I stumbled upon this blog post about SL (Sabayon Linux) today, 1st Feb 2009. The current full version of SL is 4.0-r1 (x86 and x86_64 editions available) and it is much more mature than the 3.3b Mini Edition reviewed. There are two package managers: Gentoo's Portage (source packages which are compiled on your PC) and the home-grown Entropy (binary packages which are pre-compiled for you). Entropy, its command line tool Equo and the GUI tool Spritz, have progressed in leaps and bounds over the last releases and Entropy is now an excellent binary package manager. This makes SL a much more user-friendly distribution than it used to be for the less-experienced Linux user. Packages managed using Equo and/or Spritz are much less likely to cause problems than packages installed using Portage, and this has made SL very stable for beginners. You can still use Portage if you want but I would only recommend that for experienced users. SL is now a mature member of the Linux distro community and I enjoy using it very much. Visually, its also gorgeous (perhaps due to the developer being Italian?). I "Distro Hop" and eventually drift back to Slackware. I'm impressed with Sabayon 5.oh amd64. It's fast out of the box and ships with codecs I usually have to hunt down. sometimes it can be brutal with various 64 bit distros. I've downloaded and insalled the kde version and gnome. I like the gnome version better. My dvdburner is shot and I installed the iso from the harddrive using puppy linux to extract the livecd image and grub to boot it.. it was a lot of fun. I use dvdflick to convert downloaded avi's to playable dvd through wine. until now, slackware and slack derivatives were the only distros to run dvdflick beta 1.3.0.0 to my satisfaction. Sabayon is working great for me.